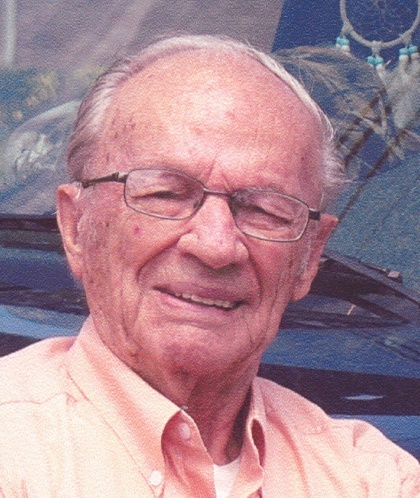 Philip K. DuFresne, 104, Two Harbors, passed away peacefully on November 13, 2018 at Ecumen Scenic Shores in Two Harbors. He was born June 20, 1914 to Henry and Hulda (Johnson) DuFresne in North Dakota. When he was a child, his mother remarried and they moved to Two Harbors, where Phil remained the rest of his life. He was the 2nd oldest of the four boys and one sister. In 1935 he married Delores (Pat) O’Brian and had 2 sons, David and Fred. In 1936, John (Boomer) Norlen, (a cousin of Pat’s) at age 12, came to live with them temporarily and stayed permanently. Phil retired with 41 years working for the D.M.I.R. (Duluth, Mesabi & Iron Range Railroad). He at one time co-owned a local pool hall with a friend in the mid 1950’s and ran the Dairy Queen for a few years in the early 1960’s. A lover of the outdoors, Phil spent most of his free time at the “Shack”. He loved hunting and could always be counted on to make his “panny cakes” for breakfast on Deer Opener. He was the official cook until he was age 92. Phil was also an avid walker, walking 3 miles a day until the age of 90. Phil’s love for his family was very apparent. His greatest joy in life was spending time with his children and grandchildren. Phil was a member of Holy Spirit Catholic Church of Two Harbors, Loyal Order of Moose, and Railway and Steamship Clerks. He is preceded in death by parents; wife, Pat; an infant son; John Norlen; granddaughter, Laurie; brothers, Earl, Douglas, and Bob; and sister, Mary. He is survived by sons David (Ronnie) of Ely and Fred (Vicki) of Two Harbors; Karin Norlen; 5 grandchildren, Brenda, Barb (John), Debbie (Ron), Patty (Pat), and Bob (Xiahua); 9 great-grandchildren; and 1 great-great-grandson. Phil’s family would like to thank the staff of Ecumen Scenic Shores and Ecumen Care Center for the loving care he received. Services will be held at 1 PM on Friday, November 30, 2018 at Cavallin Funeral Home.